Clark nevus (also known as dysplastic nevus) was initially described in melanoma-prone families, implying that it was a premalignant condition. 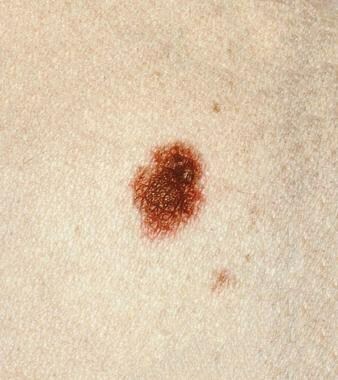 In 1820, Norris proposed an association between nevi and melanoma. He described a family in which two members developed melanoma, while other members had "many moles on various parts of their bodies." Atypical moles differ from common acquired melanocytic nevi in several respects, including diameter and lack of pigment uniformity. Confusion exists because some atypical moles cannot be clinically distinguished from melanoma. The clinical and histologic appearances of atypical moles occurring in a familial setting appear to overlap with sporadically occurring atypical moles. Atypical nevus. The central portion of this mole is a complex papule. The periphery of the lesion is macular, indistinct, slightly pink. Courtesy of the National Cancer Institute, via Wikimedia Commons. Atypical nevus. The delicate, hazy, tan, macular rim of this lesion, although not clinically dramatic, represents persistent melanocytic proliferation beyond the lateral limits of the common mole at its center. Courtesy of the National Cancer Institute, via Wikimedia Commons. This mole has a characteristic “fried-egg” appearance. The eccentric papule is an ordinary nevus. The diagnostic histologic features are found in the macular portion of the mole, particularly at the shoulder (ie, where the papule meets the macule). Courtesy of the National Cancer Institute, via Wikimedia Commons. See Mole or Melanoma? Test Yourself With These Suspicious Lesions, a Critical Images slideshow, to help identify various skin lesions. For additional information on malignant melanoma, see Malignant Melanoma. Additionally, the Medscape Skin Cancer Resource Center and Melanoma Resource Center may be helpful. Atypical nevi can be inherited or sporadic. Formal genetic analysis has suggested an autosomal dominant mode of inheritance, but genetic studies have not shown consistent data. Germline mutations in three genes, CDK2NA  and CDK4,  mapped to 9p21 and 12q14, and CMM1, mapped to 1p,  have been linked to a subset of hereditary melanomas and FAMMM syndrome. In addition, somatic mutations in PTEN,BRAF,  and MCR1 (melanocortin-1 receptor)  have been associated with melanoma, but not in patients with sporadic atypical mole syndrome. Other genomic events such as loss of heterozygosity (LOH) for tumor suppressor genes are also responsible for the progression from atypical nevi to melanoma,  and the genes thought to be responsible for most familial and sporadic atypical moles are still unknown. Ultraviolet (UV) light (UV-A and UV-B) has been proposed as both an initiator and a promoter in the transformation of melanocytes into atypical melanocytes or melanoma. Atypical nevi have a significant lower mutational load compared with melanoma, as well as different UV mutation patterns. The International Agency for Research on Cancer raised the classification of UV-emitting tanning devices from "probable carcinogenic to humans" to "carcinogenic to humans,"  and a meta-analysis concluded that use of UV tanning beds before age 30 years increases the risk of melanoma by 75%. UV light exposure may be required for full expression of FAMMM syndrome. Genetics and UV radiation may also result in a variable number and anatomical distribution of melanocytic nevi. Some patients with the atypical mole syndrome have many large and highly atypical nevi, whereas other patients with this syndrome have many nevi but only a few are atypical. In Australia and New Zealand, the prevalence of atypical nevi has been reported to be 5-10%. In Germany, approximately 2% of 500 white males aged 16-25 years were reported to have atypical nevi on biopsy analysis. Eighteen percent of a population of white adults studied in Sweden were determined to have atypical nevi clinically, although only 8% demonstrated histologic features of atypical nevi. The marked differences in prevalence between different populations may be due to true differences between these populations or they may be related to differing clinical and histologic definitions of this entity. Individuals at the highest risk of atypical nevi are persons of northern European background (Celtic) with light-colored hair and freckles. Atypical moles are rare in black, Asian, or Middle Eastern populations. No sexual predilection is reported for atypical nevi. In familial atypical moles, lesions begin to develop in childhood, most frequently during the first decade of life. Lesions may not be clinically specific early on, but typical features usually develop by the end of puberty. A personal or family history of melanoma is more predictive for the future development of a melanoma than is the number of atypical moles. The risk of melanoma is greater for those individuals who have one relative with melanoma than for those with no affected relative. The lifetime risk of melanoma may approach 100% in individuals with atypical moles who are from families prone to melanoma (ie, families having two or more first-degree relatives with melanoma). Individuals who have nevi with clinical or histologic characteristics of atypical moles but no family history of atypical moles or melanoma might also be at an increased risk for the development of melanoma. Several prospective studies have demonstrated that patients with atypical moles without an obvious family history of melanoma have an increased risk for the occurrence of melanoma. [29, 41] However, the relative risks for melanoma are lower than in those individuals with a clear family history of melanoma. Thus, the presence of atypical moles (sporadic or familial) may identify patients at increased risk for melanoma, much like fair skin or UV exposure. An individual with an isolated atypical mole has little risk of developing a melanoma and should not be identified as melanoma prone. Patients with FAMMM syndrome are at an increased risk for the development of a melanoma. The cumulative risk of melanoma in patients with FAMMM syndrome may approach 100%. Furthermore, these patients are at an increased risk for the development of multiple, primary melanomas. The likelihood of a second melanoma developing over the course of 10 years may be as high as 35% in patients with FAMMM syndrome, compared with 17% in controls who had an isolated sporadic melanoma. Melanomas that are detected early and removed quickly, because of proper and routine screening, tend to be thin, allowing for a good prognosis. Case reports suggest a possible association between uveal melanoma and patients with FAMMM syndrome. Baseline eye examination may be indicated in the workup of persons with FAMMM syndrome. 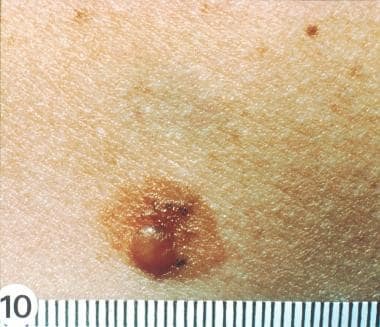 Patients should be taught self-examination to detect changes in existing moles and to recognize the clinical features of melanoma. Patients should be advised to avoid the sun whenever possible and about adequate sun protection. Patients should be advised to avoid UV tanning beds. For patient education resources, see the patient education article Mole Removal. Munro DD. Multiple active junctional naevi with family history of malignant melanoma. Proc R Soc Med. 1974 Jun. 67(7):594-5. [Medline]. Clark WH Jr, Reimer RR, Greene M, Ainsworth AM, Mastrangelo MJ. Origin of familial malignant melanomas from heritable melanocytic lesions. 'The B-K mole syndrome'. Arch Dermatol. 1978 May. 114(5):732-8. [Medline]. Clark WH Jr, Elder DE, Guerry D 4th, Epstein MN, Greene MH, Van Horn M. A study of tumor progression: the precursor lesions of superficial spreading and nodular melanoma. Hum Pathol. 1984 Dec. 15(12):1147-65. [Medline]. Duffy K, Grossman D. The dysplastic nevus: from historical perspective to management in the modern era: part I. Historical, histologic, and clinical aspects. J Am Acad Dermatol. 2012 Jul. 67 (1):1.e1-16; quiz 17-8. [Medline]. Elder DE, Goldman LI, Goldman SC, Greene MH, Clark WH Jr. Dysplastic nevus syndrome: a phenotypic association of sporadic cutaneous melanoma. Cancer. 1980 Oct 15. 46(8):1787-94. [Medline]. Lynch HT, Frichot BC 3rd, Lynch JF. Familial atypical multiple mole-melanoma syndrome. J Med Genet. 1978 Oct. 15 (5):352-6. [Medline]. Reed RJ. A classification of melanocytic dysplasias and malignant melanomas. Am J Dermatopathol. 1984 Summer. 6 Suppl:195-206. [Medline]. Rhodes AR, Mihm MC Jr, Weinstock MA. Dysplastic melanocytic nevi: a reproducible histologic definition emphasizing cellular morphology. Mod Pathol. 1989 Jul. 2 (4):306-19. [Medline]. Ackerman AB. What naevus is dysplastic, a syndrome and the commonest precursor of malignant melanoma? A riddle and an answer. Histopathology. 1988 Sep. 13 (3):241-56. [Medline]. Annessi G, Cattaruzza MS, Abeni D, Baliva G, Laurenza M, Macchini V, et al. Correlation between clinical atypia and histologic dysplasia in acquired melanocytic nevi. J Am Acad Dermatol. 2001 Jul. 45(1):77-85. [Medline]. Clemente C, Cochran AJ, Elder DE, Levene A, MacKie RM, Mihm MC, et al. Histopathologic diagnosis of dysplastic nevi: concordance among pathologists convened by the World Health Organization Melanoma Programme. Hum Pathol. 1991 Apr. 22(4):313-9. [Medline]. Klein LJ, Barr RJ. Histologic atypia in clinically benign nevi. A prospective study. J Am Acad Dermatol. 1990 Feb. 22(2 Pt 1):275-82. [Medline]. Lebe B, Pabuççuoglu U, Ozer E. The significance of Ki-67 proliferative index and cyclin D1 expression of dysplastic nevi in the biologic spectrum of melanocytic lesions. Appl Immunohistochem Mol Morphol. 2007 Jun. 15(2):160-4. [Medline]. Massi D, Naldini A, Ardinghi C, Carraro F, Franchi A, Paglierani M, et al. Expression of protease-activated receptors 1 and 2 in melanocytic nevi and malignant melanoma. Hum Pathol. 2005 Jun. 36(6):676-85. [Medline]. Clarke LE. Dysplastic nevi. Clin Lab Med. 2011 Jun. 31(2):255-65. [Medline]. Reddy KK, Farber MJ, Bhawan J, Geronemus RG, Rogers GS. Atypical (dysplastic) nevi: outcomes of surgical excision and association with melanoma. JAMA Dermatol. 2013 Aug. 149(8):928-34. [Medline]. NIH Consensus Conference. Diagnosis and treatment of early melanoma. JAMA. 1992 Sep 9. 268(10):1314-9. [Medline]. Cannon-Albright LA, Goldgar DE, Meyer LJ, Lewis CM, Anderson DE, Fountain JW, et al. Assignment of a locus for familial melanoma, MLM, to chromosome 9p13-p22. Science. 1992 Nov 13. 258(5085):1148-52. [Medline]. Nobori T, Miura K, Wu DJ, Lois A, Takabayashi K, Carson DA. Deletions of the cyclin-dependent kinase-4 inhibitor gene in multiple human cancers. Nature. 1994 Apr 21. 368(6473):753-6. [Medline]. Bale SJ, Dracopoli NC, Tucker MA, Clark WH Jr, Fraser MC, Stanger BZ, et al. Mapping the gene for hereditary cutaneous malignant melanoma-dysplastic nevus to chromosome 1p. N Engl J Med. 1989 May 25. 320(21):1367-72. [Medline]. Celebi JT, Ward KM, Wanner M, Polsky D, Kopf AW. Evaluation of germline CDKN2A, ARF, CDK4, PTEN, and BRAF alterations in atypical mole syndrome. Clin Exp Dermatol. 2005 Jan. 30(1):68-70. [Medline]. Chaudru V, Laud K, Avril MF, Minière A, Chompret A, Bressac-de Paillerets B, et al. Melanocortin-1 receptor (MC1R) gene variants and dysplastic nevi modify penetrance of CDKN2A mutations in French melanoma-prone pedigrees. Cancer Epidemiol Biomarkers Prev. 2005 Oct. 14(10):2384-90. [Medline]. Celebi JT, Ward KM, Wanner M, Polsky D, Kopf AW. Evaluation of germline CDKN2A, ARF, CDK4, PTEN, and BRAF alterations in atypical mole syndrome. Clin Exp Dermatol. 2005 Jan. 30 (1):68-70. [Medline]. Uribe P, Wistuba II, Gonzalez S. Allelotyping, microsatellite instability, and BRAF mutation analyses in common and atypical melanocytic nevi and primary cutaneous melanomas. Am J Dermatopathol. 2009 Jun. 31(4):354-63. [Medline]. Melamed RD, Aydin IT, Rajan GS, Phelps R, Silvers DN, Emmett KJ, et al. Genomic Characterization of Dysplastic Nevi Unveils Implications for Diagnosis of Melanoma. J Invest Dermatol. 2017 Apr. 137 (4):905-909. [Medline]. [Guideline] IARC Working Group. Special Report: Policy A Review of human carcinogens- Part D: radiation. The Lancet. 2009/08. 10:751-752. [Full Text]. IARC Working Group. The association of use of sunbeds with cutaneous malignant melanoma and other skin cancers: a systematic review. Int J Cancer. 2006. 120:1116-22. Tsao H, Sober AJ. Atypical melanocytic nevi. Freedburg IM, ed. Fitzpatrick's Dermatology in General Medicine. 6th ed. New York, NY: McGraw-Hill; 2003. Vol 1: 906-16. Kraemer KH, Greene MH, Tarone R, Elder DE, Clark WH Jr, Guerry D 4th. Dysplastic naevi and cutaneous melanoma risk. Lancet. 1983 Nov 5. 2(8358):1076-7. [Medline]. Cooke KR et al. Dysplastic naevi in a population-based survey. Cancer. 1989. 63:1240. Goldstein AM, Chan M, Harland M, et al. Features associated with germline CDKN2A mutations: a GenoMEL study of melanoma-prone families from three continents. J Med Genet. 2007 Feb. 44 (2):99-106. [Medline]. Banky JP, Kelly JW, English DR, Yeatman JM, Dowling JP. Incidence of new and changed nevi and melanomas detected using baseline images and dermoscopy in patients at high risk for melanoma. Arch Dermatol. 2005 Aug. 141(8):998-1006. [Medline]. Halpern AC, Guerry D 4th, Elder DE, Trock B, Synnestvedt M, Humphreys T. Natural history of dysplastic nevi. J Am Acad Dermatol. 1993 Jul. 29 (1):51-7. [Medline]. Salopek TG. The dilemma of the dysplastic nevus. Dermatol Clin. 2002 Oct. 20(4):617-28, viii. [Medline]. Bevona C, Goggins W, Quinn T, Fullerton J, Tsao H. Cutaneous melanomas associated with nevi. Arch Dermatol. 2003 Dec. 139(12):1620-4; discussion 1624. [Medline]. Geller AC, Swetter SM, Brooks K, Demierre MF, Yaroch AL. Screening, early detection, and trends for melanoma: current status (2000-2006) and future directions. J Am Acad Dermatol. 2007 Oct. 57(4):555-72; quiz 573-6. [Medline]. Silva JH, Sá BC, Avila AL, Landman G, Duprat Neto JP. Atypical mole syndrome and dysplastic nevi: identification of populations at risk for developing melanoma - review article. Clinics (Sao Paulo). 2011. 66(3):493-9. [Medline]. [Full Text]. Marinkovic M, Janjic Z, Nikolic J. Dysplastic nevus--a risk factor of developing skin melanoma clinical and epidemiological study with retrospective review of literature. Med Pregl. 2011 May-Jun. 64(5-6):315-8. [Medline]. Gandini S, Sera F, Cattaruzza MS, Pasquini P, Abeni D, Boyle P, et al. Meta-analysis of risk factors for cutaneous melanoma: I. Common and atypical naevi. Eur J Cancer. 2005 Jan. 41 (1):28-44. [Medline]. Kanzler MH, Swetter SM. 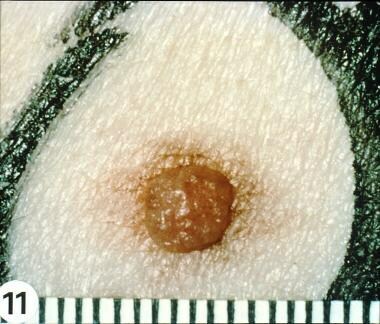 Malignant melanoma. J Am Acad Dermatol. 2003 May. 48(5):780-3. [Medline]. de Snoo FA, Kroon MW, Bergman W, ter Huurne JE, Houwing-Duistermaat JJ, van Mourik L, et al. From sporadic atypical nevi to familial melanoma: risk analysis for melanoma in sporadic atypical nevus patients. J Am Acad Dermatol. May 2007. 56:748-52. [Medline]. Leachman SA, Carucci J, Kohlmann W, Banks KC, Asgari MM, Bergman W. Selection criteria for genetic assessment of patients with familial melanoma. J Am Acad Dermatol. 2009 Oct. 61(4):677.e1-14. [Medline]. Singh AD, Damato B, Howard P, Harbour JW. Uveal melanoma: genetic aspects. Ophthalmol Clin North Am. 2005 Mar. 18(1):85-97, viii. [Medline]. Lynch HT, Fusaro RM, Lynch JF. Hereditary cancer syndrome diagnosis: molecular genetic clues and cancer control. Future Oncol. 2007 Apr. 3(2):169-81. [Medline]. Bronsnick T, Kazi N, Kirkorian AY, Rao BK. Outcomes of biopsies and excisions of dysplastic acral nevi: a study of 187 lesions. Dermatol Surg. 2014 Apr. 40(4):455-9. [Medline]. Roesch A, Burgdorf W, Stolz W, Landthaler M, Vogt T. Dermatoscopy of "dysplastic nevi": a beacon in diagnostic darkness. Eur J Dermatol. 2006 Sep-Oct. 16(5):479-93. [Medline]. Pellacani G, Farnetani F, Gonzalez S, Longo C, Cesinaro AM, Casari A, et al. In vivo confocal microscopy for detection and grading of dysplastic nevi: a pilot study. J Am Acad Dermatol. MAR/2012. 66:e109-21. [Medline]. Balu M, Kelly KM, Zachary CB, Harris RM, Krasieva TB, König K, et al. Distinguishing between benign and malignant melanocytic nevi by in vivo multiphoton microscopy. Cancer Res. 2014 May 15. 74 (10):2688-97. [Medline]. Babacan A, Lebe B. Grade of Atypia in Dysplastic Nevi and Relationship with Dermal Fibroplasia. Turk Patoloji Derg. 2012. 28(1):17-23. [Medline]. Campoli M, Fitzpatrick JE, High W, Ferrone S. HLA antigen expression in melanocytic lesions: Is acquisition of HLA antigen expression a biomarker of atypical (dysplastic) melanocytes?. J Am Acad Dermatol. 2012 Jun. 66(6):911-916.e8. [Medline]. Farrahi F, Egbert BM, Swetter SM. Histologic similarities between lentigo maligna and dysplastic nevus: importance of clinicopathologic distinction. J Cutan Pathol. 2005 Jul. 32(6):405-12. [Medline]. Strazzula L, Vedak P, Hoang MP, Sober A, Tsao H, Kroshinsky D. The utility of re-excising mildly and moderately dysplastic nevi: A retrospective analysis. J Am Acad Dermatol. 2014 Dec. 71(6):1071-6. [Medline]. Mendese G, Maloney M, Bordeaux J. To scoop or not to scoop: the diagnostic and therapeutic utility of the scoop-shave biopsy for pigmented lesions. Dermatol Surg. 2014 Oct. 40(10):1077-83. [Medline]. Comfere NI, Chakraborty R, Peters MS. Margin comments in dermatopathology reports on dysplastic nevi influence re-excision rates. J Am Acad Dermatol. 2013 Nov. 69(5):687-92. [Medline]. Duffy KL, Mann DJ, Petronic-Rosic V, Shea CR. Clinical decision making based on histopathologic grading and margin status of dysplastic nevi. Arch Dermatol. 2012 Feb. 148(2):259-60. [Medline]. Somani N, Martinka M, Crawford RI, Dutz JP, Rivers JK. Treatment of atypical nevi with imiquimod 5% cream. Arch Dermatol. 2007 Mar. 143(3):379-85. [Medline]. Francis SO, Mahlberg MJ, Johnson KR, Ming ME, Dellavalle RP. Melanoma chemoprevention. J Am Acad Dermatol. 2006 Nov. 55(5):849-61. [Medline]. Tripp JM, Kopf AW, Marghoob AA, Bart RS. Management of dysplastic nevi: a survey of fellows of the American Academy of Dermatology. J Am Acad Dermatol. 2002 May. 46(5):674-82. [Medline].